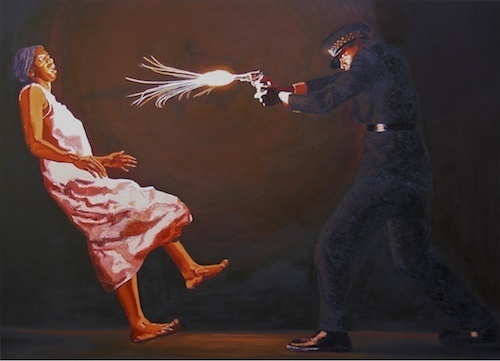 Kimathi Donkor, Under Fire, 2005, oil on linen, 47 1/2 x 71 1/2". In “Queens of the Undead,” a two-part exhibition of large-scale oil paintings on linen, artist Kimathi Donkor pays homage to historical figures that represent both authority and victimhood in equal measure. In the first part, the works portray heroic black women through the ages. When we shall 3?, 2010, for example, is a portrait from the series “Scenes from the life of Njinga Mbandi,” 2010; it depicts a moment during a seventeenth-century meeting with the Portuguese governor João Correia de Sousa, when Mbandi, the queen of Angola, refused to accept a floor mat as a seat, instead summoning a servant to bend over and act as her chair. This, when seen alongside equally vivid works that depict female leaders liberating their people, such as Harriet Tubman en route to Canada and Yaa Asantewaa inspecting the dispositions at Ejisu, both 2012, evokes the freeing power of authority. In an interesting juxtaposition, however, the second part depicts the destruction that can be caused by the abuse of such authority. Donkor here presents images of the victims of police brutality in the UK, either in the precise moment of their deathas with Madonna Metropolitan, 2005or in a symbolic and heavenly reunion of the victims, with Johnny was borne aloft by Joy and Stephen, 2010. Yet, despite the sense of grief emanating from these works, the wall text draws our attention to the changes that these tragedies have instigated; for example, the deplorable handling of Stephen Lawrence’s murder, which happened in 1993, led to the landmark exposure of pervasive institutional racism within the Metropolitan Police. These works are dedicated to, as Donkor notes, “the undead glory of charismatic black women.” That said, his images are so deeply poignant that the exhibition speaks not solely to issues of race but also to basic human issues of struggle and victory.